As I drove back to the ranchito yesterday afternoon from Abilene, moving with light traffic on Interstate 20 near Eastland, Texas, I looked northeast and saw towering pyrocumulus clouds. 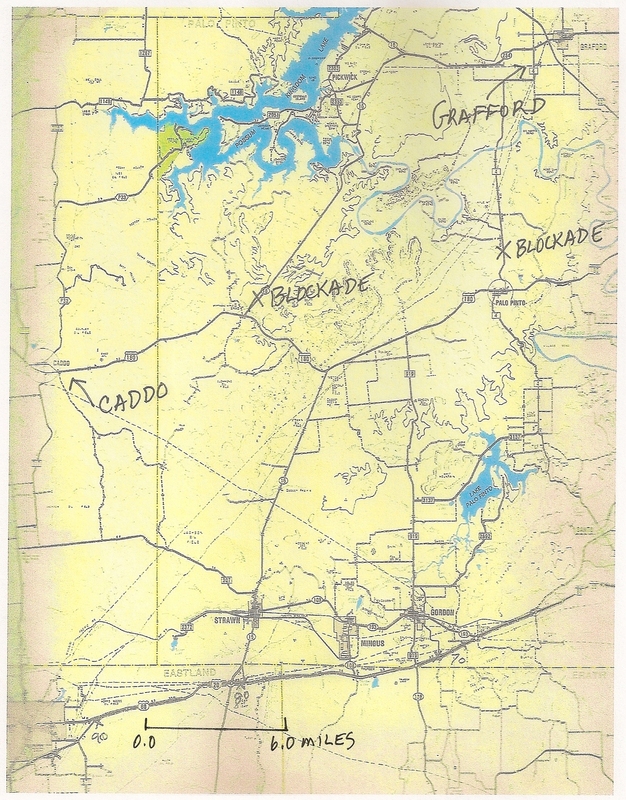 Approximately forty to fifty miles away from where I drove on the highway, I pinpointed the fires at Palo Pinto, Texas, or Possum Kingdom Lake. My ranchito lay far away from the inferno, so my anxiety lessened and I began to think more intently about the precise location. The smoke rose high in the sky, becoming pyrocumulus, rolling and billowing upwards. It had started at about 1:30 p.m. When I arrived at the house, I turned on the television and Dallas-Fort Worth stations reported the fires near Possum Kingdom Lake, the southeastern side of the huge lake that dams the Brazos River, the largest river in Texas. In April, fires had erupted about the lake, destroying homes and thousands of acres of trees and grass with attendant wildlife. Once again, Possum Kingdom habitat ignites, the residents flee not having time to salvage photos or documents. I ruminate that our region suffers a drought, cow tanks dry, underbrush decadent and my primary source of water, the Barton Creek Cooperative, restricts water use with heavy penalties for violators. In the Possum Kingdom fire zone, summer camps for teenagers and children abound, primary homes and secondary homes stand close to trees that are pruned carefully, the underbrush removed as a fire hazard. Yet, so, when the spark falls on the dead, crackly grass and brush, natural forces beyond man’s control take precedence and airships with their whap-whap-whap of whirling blades pour water onto flames that send smoke and ashes high into the sky, creating pyrocumulus in the blue skies of Texas. I think of a line from Full Metal Jacket: Who is in command here? The origin of the fire is unknown and as of this morning, August 31, the fire is not contained. For a morning news report, August 31, 2011, see “Wildfires burning homes in Texas, Oklahoma,” from MSNBC. The quote from the movie, “Who’s in command here?” originally read Apocalypse Now. The proper citation is from the movie, Full Metal Jacket. The photograph from MSNBC shows smoke and ash close to the ground and none of the “clouds” are pyrocumulus. I saw the pyrocumulus while on the interstate highway and I failed to use my iPhone to photograph the phenomenon. About our place, rain has fallen the last two days. For us the fire danger is gone. Storms knocked out our internet provider. This is a text message via wireless. Our IP does have a dialup number as backup and I will use it if necessary. Yucca blossoms are on the way. A roadrunner darted across the Well House Corral. Queen Ann’s Lace erupts overnight. The pond is up. 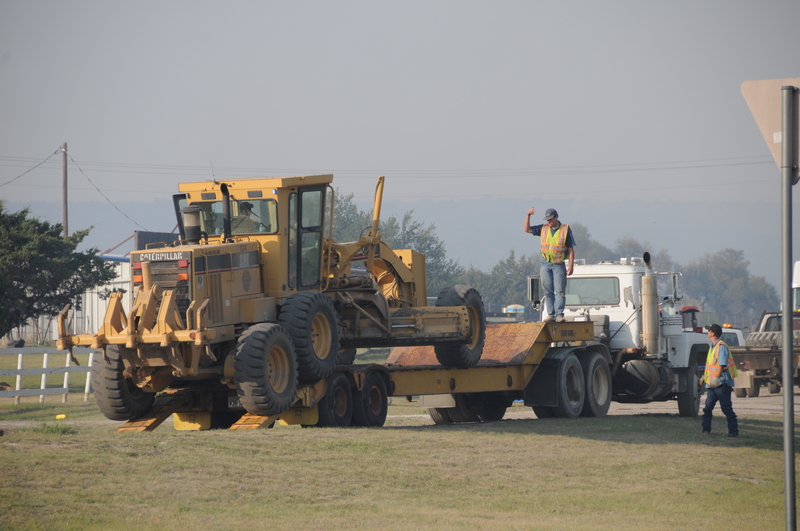 Firefighters loading bulldozer for the run to Palo Pinto, Texas, when it was ordered evacuated. I have resided mostly in Texas all of my life and when young I do not remember wildfire. For some reason pastures and forests in Texas have changed, and within the last ten years in south Palo Pinto County and north Erath County, fires have erupted and destroyed trees, wildlife, livestock, pastures, firemen and innocents. By my count, around Strawn, Mingus and Gordon, Texas, three large wildfire outbreaks have occurred within the last ten years. On two occasions, I have hitched trailers to move horses off of our ranch and have prepared checklists for evacuation. At night, the mountainsides appear to have torches marching down to our pastures to kill and maim the living. The next morning, trees smolder on the slopes, the torches of the night before. Fire brings a clarity to decision-making: there’s no ambiguity about whether to do one chore or another, read one book or the other or how to spend one’s day at work or on the ranch. You don’t worry about combing your hair or washing your face. You fight the fire. You wait. Or, you evacuate. Forget muddling around and killing time for your home, livestock or grassland may not exist this time tomorrow. And, neither may wildlife you have observed. Only fishes in cow tanks will make it through the day if they are not sucked up by helicopters filling their water tanks. Within this last week, the Possum Kingdom Complex Fire came within seven miles of our place before the night fell and winds died. Then the next day, the winds shifted and carried the flames northward. A shift in wind the day after that and Palo Pinto was ordered to evacuate, the town where we have our house insurance and our branch bank. The clarity of wildfire is the clarity of life and death. Today you are here, but tomorrow all you possess and cherish may be gone. Non-existence may be sooner rather than later. That much is clear. Please note that if you wish to add your VFD to this list or give other pertinent information, please e-mail me at matthewsranch@msn.com and I will append your information to this list. I mean no offense if you are not on this list, so assist me in compiling this information. Thanks — Jack Matthews. I have compiled a list of a number of volunteer fire departments that I have seen in the field fighting the Possum Kingdom Complex Fire on the southern, middle and western sides of the fire lines. Contact the VFD by telephone for information on giving cash donations or other commodities. Please note that other VFDs have worked in the fire zones that I do not list here. I have seen Fort Worth, Bedford, Dallas, Graham, Coleman, Cunningham and other companies in the area. These are the VFDs closest to my area in southern Palo Pinto-northern Erath Counties of Texas. Please link and refer to the Texas Forest Service updates, Department of Public Safety and county law enforcement officials for up-to-date information. I am unable to enter the restricted areas and the official pronouncements have the final say in operational policies during these wildfire events. That being said, I stand by my field observations as described herein. At about noon, I drove to Caddo by way of SH 717 from Ranger, turned east and drove US 180 to Palo Pinto, and then back home. The winds blew light, not brazen as they have the last few days, and the temperatures never climbed above 70 degrees for the two hours I traveled along the southern edge of the Possum Kingdom Complex Fire. The skies are overcast and early this morning a mist fell briefly. As I drove the F-250 near the Macedonia Cemetery on SH 717, the temperature dipped to 64 degrees. I saw one plume of smoke west of SH 717, and then as I sped past Caddo and down the Palo Pinto Mountains towards Palo Pinto, the hot spots I have seen in the last few days were calm. Sadly, that was not the case farther east. I saw smoke north of US 180 east of Possum Kingdom Lake, and the Highway Patrol blockaded SH 4 out of Palo Pinto towards Graford and SH 16. I saw power company trucks carrying new poles to replace those that had been burned. I read that the firefighters still labor at fire lines near Graford and Possum Kingdom East. Despite overcast skies and lower temperatures, the fight continues. See the Texas Forest Service updates on the right sidebar of the blog. Click on their website for additional information. From US 180, going south on SH 919, back to the ranch, all appeared clear of wildfire and smoke plumes. Gordon, Texas, schools were open and the Burlington Northern Santa Fe Railway construction and repair crews were assembling machines and materials adjacent to the Gordon Volunteer Fire Department and Emergency Responders. Stowe Ford Company displayed their vehicles on their lots, a King Ranch F-250 looked especially nice. The Stowe Ford Company in Gordon is the second oldest Ford dealership in Texas. My wife teaches at Texas Wesleyan University in Fort Worth, Texas, and the University sent an e-mail message yesterday, April 19, 2011, to the faculty. The Methodist Church at Possum Kingdom Lake burned and the Methodist Conference has undertaken relief efforts to the area for all inhabitants, Methodist or not. If you are thinking about donations for the Possum Kingdom Lake Complex Fire relief, I quote the e-mail below. I have seen the Red Cross and Salvation Army stations set up at Strawn, Gordon and Palo Pinto. They seem to be moving with the activity and need, so there also would be an opportunity to help. 3. Victims: Long-term needs are household items. If you have any questions please feel free to contact the Weatherford District office at 1-888-423-5378 or Laraine Waughtal, Conference Disaster Response Coordinator, at 254-595-1503. 20 APR 11 Map of region traveled today. SH 717 is far west, north of Ranger to Caddo. Correction: map caption changed. Distance legend should be 0.0 to 6.0 miles. SH 717 location identified.